Q. I recently took over responsibility for my company's TimePilot system and have some questions to ask your support technicians. What do I need to know before I call or e-mail? What is the name of the product you're calling about? TimePilot has a variety of timeclocks, and the technician's answers to your questions may well depend upon which product you own. Not sure? Click here to see photos of each. What version of the TimePilot software are you using? To find out, click the "Help" menu in the TimePilot software, then choose "About." Q. I just bought a new Vetro system and am having trouble getting the new software to import my old data. I’ve run the Conversion Utility, but it appears my old transactions aren’t being imported. What am I doing wrong? Q. Our Vetro clocks are on our network. Is there a way to assign iButtons right at my PC and transfer that data to the clocks? A. Yes. You'll need a Blue Dot Receptor. (You're in luck: They're on sale to readers of this month's newsletter. See the right-hand column of this newsletter for details.) With the Receptor plugged into your PC, you just tap the employee's iButton while you're creating the employee's profile. You can also use a TimePilot Tap+ for this purpose. See the answer to the next question for instructions on how to get the employee's name and iButton number into each clock. Q. I have a Vetro system that’s connected to my network. What's the best way to get the employees' info into my clock? Q. How do I restrict an employee from clocking in and out, but not remove him or her from the system? A. Uncheck the "Active" checkbox in the employee's profile. This will prohibit the employee from clocking in and out but will allow the employees' information to remain in the system for processing payroll. If an employee has current transactions, he or she cannot be deleted until their transactions are extracted with a pay period. Generally, we recommend marking an employee "Inactive" instead of deleting an employee. However, once all the employee's clock-ins and clock-outs are extracted, you will be able to delete their profile. Even if you delete an employee profile, though, that profile will remain in any extracted pay period where he or she has clock-ins and clock-outs; if it did not, there would be transactions without a name attached to them. Another good reason to use "Inactive" is for seasonal employees or employees who might get rehired: When they come back to work, you don't have to set up a new employee; just make them "Active" again. The adjustable hour: The ancient Egyptians defined the hour to be one-twelfth of the time between sunrise and sunset. So as the days grew longer in winter and spring and shorter in summer and autumn, the length of the hour varied from one day to the next. Time warp: Australia has both horizontal and vertical time zones, and only two of the country's five zones use daylight saving time. TimePilot Tips: Installing on multiple PCs. A less-than-obvious way to use TimePilot Tap+. The Deal: Blue Dot Receptors, $20 off! A little over a month ago, we unveiled our newest product: TimePilot Tap+, the ultimate portable timeclock. It has become a very popular product, and we’re finding out that the clock is being used in surprising ways. We intended Tap+ to be the ultimate portable timeclock, and envisioned companies using two or three or more Tap+ clocks throughout their facility as well as by employees on the road and in the field. But some customers have been using their Tap+ clocks in a very different way. Instead of carrying them far and wide, they’re leaving their Tap+ clocks on a desk or a counter, cabled to their PC. 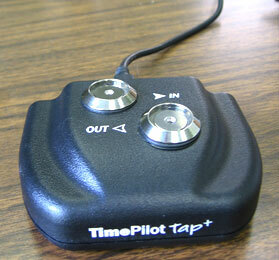 Used this way, the Tap+ becomes a very simple, easy-to-use timeclock, both for employees and for supervisors. Clock ins and clock-outs are transferred instantly to the PC (if it’s running! ), so supervisors can see immediately who’s at work and who’s not. Other desktop timeclocks are heavy and have a large “footprint.” The Tap+ is just 5 ounces and a little larger than a deck of cards. In other words, it's easy to slide it out of the way if it starts making a nuisance of itself. When you add a new employee or an employee leaves your company, there’s no need for a supervisor to transfer those changes to the clock--it's done automatically. The TimePilot Tap+ Starter Kit is just $299 and additional clocks are as little as $130 each. For more about TimePilot Tap+, visit our web site, www.TimePilot.com. 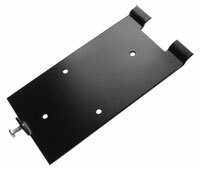 Our new TimePilot Vetro Mounting Plate simplifies securing your Vetro to a wall and provides some security. The heavy-gauge steel plate mounts with the two included wall anchors and screws. Two hooks at the top of the plate fit indentations on the back of the Vetro clock and the clock is secured to the plate with a screw at the bottom of the assembly. When the clock is secured to the plate, the screw is hidden from casual view. The optional plate measures 5 inches by 2.5 inches, is painted black and contains four holes in a diamond pattern. Just $24.00. For users of TimePilot PC, it can be mounted at a PC and used with iButtons to clock in and out. For users of TimePilot Vetro and TimePilot Standard, it can be used to set up iButtons at the PC. 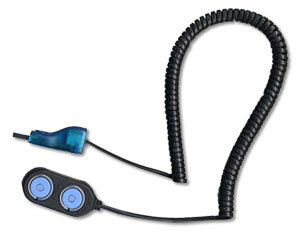 This product is included in the TimePilot Extreme Starter Kit and is used to set up iButtons for the system. © Copyright 2012, TimePilot Corp. All rights reserved.